The irregular satellites are natural moons of the giant planets in our solar system. While the regular satellites, like the Galilean are on prograde, near-circular orbits close to the equatorial plane of their host planet, the irregular satellites are on more distant, highly eccentric and highly inclined orbits. A major fraction of the irregular satellites are retrograde with inclinations greater than 90 degrees. Currently there are 107 known irregular satellites (54 orbit Jupiter; 38 orbit Saturn; 9 orbit Uranus; and 6 orbit Neptune). The difference in the known numbers is generally attributed to the increasing difficulty experienced in observing these objects as the distances to the planets increase. One major feature of the irregular satellites is that their orbits are dynamically clustered into families (Gladman et al. 2001; Sheppard & Jewitt 2003). The families orbiting Jupiter have been named after their largest known member. Jupiter has at least five known groups, two of which are prograde (with the biggest members being Himalia and Themisto) and three that are retrograde (Ananke, Carme and Pasiphea). The families of irregular satellites around Saturn have been named for the mythos that inspired the names of their members. There are two known prograde groups, the Inuit and the Gallic. The retrograde satellites, except for Phoebe, are named after nordic ice giants, and no clear family structure is apparent, although more than three dierent groupings may exist. We found observations of nine irregular satellites of Jupiter in the WISE single-exposure image and extract source data. Five of the objects (J6 Himalia, J7 Elara, J8 Pasiphae, J9 Sinope, and J11 Carme, ) were detected in all four bands. One object (J10 Lysithea) was detected in three bands. The remaining three objects (J12 Ananke, J13 Leda, and J17 Callirrhoe) were detected in the two longest bands. While J18 Themisto should be bright enough to be seen by WISE, it crossed the spacecraft eld-of-view while it was close to Jupiter and its flux was completely drowned out by the scattered light from the planet. Observations of two additional Jovian irregular satellites, J23 Kalyke and J27 Praxidike, were extracted in one band by stacking all available observations of the objects. Stacks were also created using the ephemerides of J19 Megaclite, J20 Taygete and J24 Iocaste, but no signal was detected for these objects. Only S9 Phoebe was bright enough among the Saturnian irregular satellites to be detected by WISE in single observations, with strong signal available in the three bands. We were able to use stacking to extract one band observation of S26 Albiorix and S29 Siarnaq. Stacks were attempted for S20 Palliaq and S21 Tarvos, but no signal was detected in either band for these two objects. The irregular satellites, particularly the retrograde Jovian irregulars, show some of the lowest visible geometric albedos on any population of small solar system bodies observed by WISE, with a inverse variance weighted mean albedo of 4.3%±1.4%. With the exception of S9 Phoebe, every irregular satellite observed by WISE is on the dark end of the distribution of geometric visible albedo found in the dark component of the main asteroid belt, the Hilda population, the Jovian Trojan population, and blue component of the Centaur population (Masiero et al. 2011; Grav et al. 2011, 2012a,b; Bauer et al. 2013). Only the comet population, with a mean geometric visible albedo of 3.8%±0.9%, have similarly dark surfaces. The low albedo of the irregular satellites may be indicative of an origin for these bodies that are distinct from other solar system objects, or may trace unique physical or evolutionary processes that these bodies were subjected to between formation and the present day. Further photometric and taxonomic studies of these objects will enable us to place them in context of the rest of the solar system and help to constrain potential evolutionary pathways. This work has been accepted for publication in Astrophysical Journal and the full pre-print is available at arXiv. Our Near-Earth Object Wide-field Infrared Survey Explorer (NEOWISE-R) has finished the first year of its reactivated mission and has observed more than 10,000 asteroids. The data include 245 near-Earth objects (NEOs), of which 40 were new discoveries. In addition the data contained 35 comets, of which 3 were new discoveries. One of the comets observed has turned into the brightest comet in our night sky in early 2015, comet C/2014 Q2 (Lovejoy). NEOWISE always looks in the dawn and twilight skies – the direction perpendicular to a line between Earth and the Sun. This unique vantage point makes NEOWISE a particularly efficient at spotting the Potential Hazardous Asteroids (PHAs), a subset of the near-Earth Objects that may present a hazard to our planet. The Wide-field Infrared Survey Explorer (WISE) was an astrophysics mission launched in late 2009 and subsequently place into hibernation in early 2011 after its primary mission was completed. In late 2013 the satellite was reactivated and embarked on a new mission to assist NASA’s efforts to discover and track the population of PHAs, under a new mission name of NEOWISE-R. The data collected allows us to provide information about the sizes and composition of the objects observed. 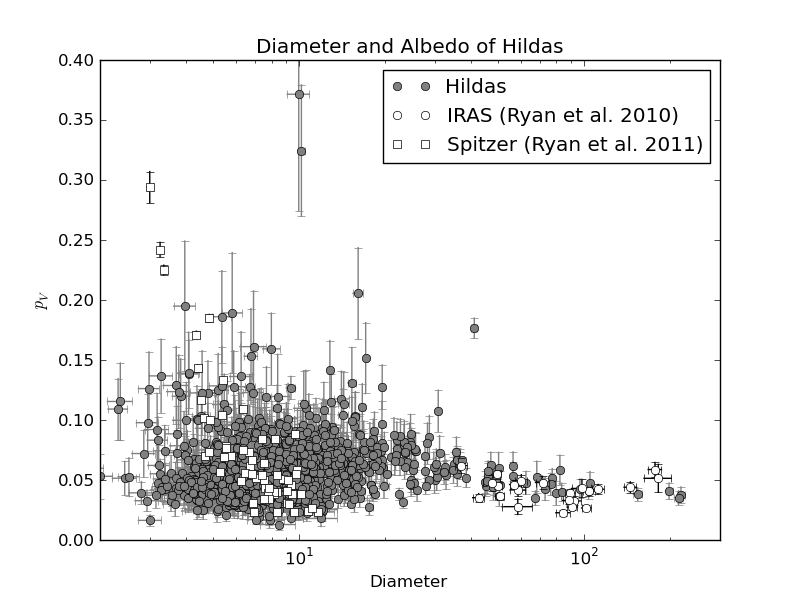 The diameter and albedo distribution of the Hilda population observed by the NEOWISE project. The Hilda population is trapped in the interior 3:2 mean motion resonance with Jupiter. The populations orbits are such that the objects form a triangle with the corners 60 degrees ahead of Jupiter, 60 degrees ahead of Jupiter, and on the opposite side of the Sun from Jupiter. The objects therefore do not have close encounters with Jupiter and stay long time stable. NEOWISE observed more than 1700 Hilda asteroids during the cryogenic portion of the mission. The figure shows the results of the thermal modeling of these objects, revealing their diameter and albedo distribution. The results showed that the population is dark and dominated by C-, P- and D-type asteroids at all sizes, with only a handful of possible interlopers with different taxonomic types. The results were published in Grav et al. (2012) and the electronic table of diameters and albedos for all the Hilda objects observed are available at the publishers website.